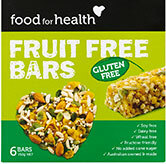 New Fruit Free Bars! A healthy snack for the whole family that is gluten free, dairy free fructose friendly, soy free, wheat free and with no added cane sugar. We have travelled worldwide to personally select the very best quality allergy friendly products, to meet the needs of New Zealand consumers with specific dietary requirements. Our exclusive products are suitable for those who may be Gluten Intolerant, Wheat Intolerant, Coeliacs, those with food allergies or food sensitivity, and for anyone who would simply like to make better, more health conscious food choices. Our passion is to provide a range of quality products that are delicious, allergy friendly, well presented, and are able to be enjoyed by the whole family. More than just providing excellent quality gluten free products, we have been successful in providing products with the “wow factor” - products of such great taste and quality that you won’t know the difference when choosing our healthier, allergy friendly foods. It is our continued challenge to offer our products across all categories, including meals, breakfast, snacks and sweet treats, in a constantly expanding range of healthier food options.